Ms Black, who was elected to the House of Commons the year after Scots voted to stay in the United Kingdom, said it was the most bizarre thing she was hit by. Speaking in the second episode of BBC Scotland’s Yes/No: Inside the Indyref documentary, the Paisley and Renfrewshire South MP says “everybody got abuse” in the run-up to the historic 2014 ballot. She said: “I had guys with Union Jacks running at me and things. “The strangest thing I had thrown at me was a Bovril cube. But it wasn’t just any Bovril cube, they’d unwrapped it and flung it. Mr Murphy, who was hit with an egg when he took his street campaign to Kirkcaldy in Fife, said there were occasions when the behaviour of some campaigners was “absolutely intimidating”. He told the programme a group of about 100 people wearing Yes stickers had turned up when he spoke in Motherwell in what he described as a “completely orchestrated” incident. The former MP recalled: “We set up our table with stickers and leaflets, they just kicked the table over. Blair McDougall, campaign director for the pro-UK, cross-party Better Together group, said Mr Murphy’s speaking tour of 100 towns across Scotland had to be suspended for a while “really for the safety of our staff”. TV historian Dan Snow, whose father-in-law was the 6th Duke of Westminster, told how he came in for online abuse when he became involved in the campaign. 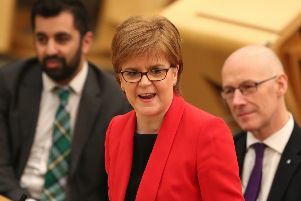 His Let’s Stay Together initiative featured celebrities including Sir Mick Jagger and Dame Judi Dench signing an open letter urging Scots to reject independence. Stuart Campbell, who writes the pro-independence Wings Over Scotland blog, said: “Other countries’ independence campaigns have waded knee deep in blood. Yes/No: Inside the Indyref will air at 10pm on Tuesday March 12 on BBC Scotland.